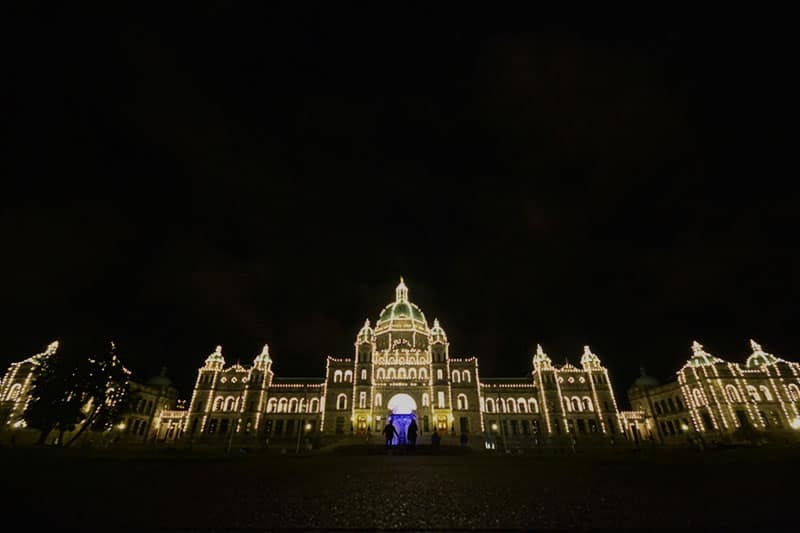 After losing my job, I needed some time to just relax, so this past weekend, I headed over to Victoria, B.C. where I went to university to visit some friends. Looking back on the weekend, all I feel like we did was eat, shop and sip wine. Definitely not the worst thing to do for on weekend dedicated to recharging! Victoria is a city of brunch. There are so many places that cater to this midmorning stable and there are constantly new ones popping up in the city. It’s quite normal to head out for brunch and easily have to wait an hour or more before you get a table (unless you go right after opening!). There are long lines that form along side some of the city’s most popular locations. 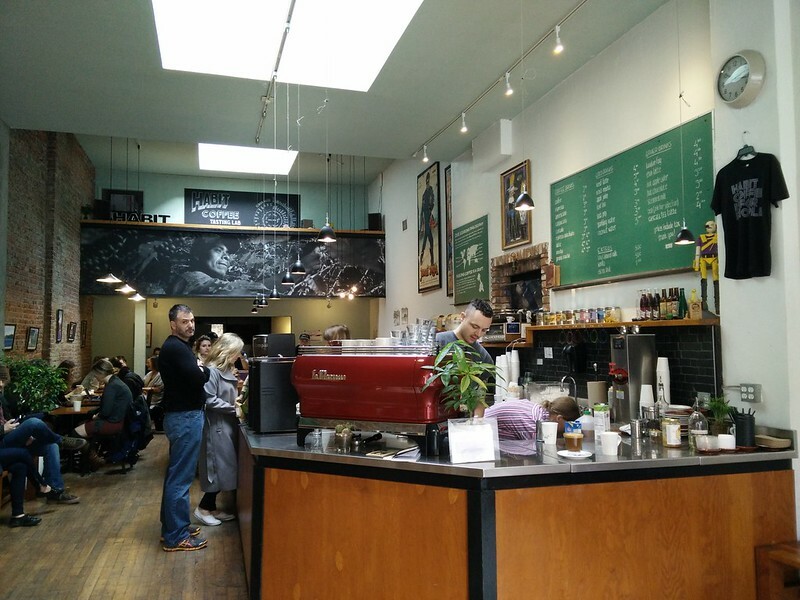 However at Mo:Le, instead of standing outside, you can head next door to Habit Coffee, with the same owners, to grab a coffee and seat to wait for your table. The best part? You can bring your coffee over to enjoy with your brunch as well. 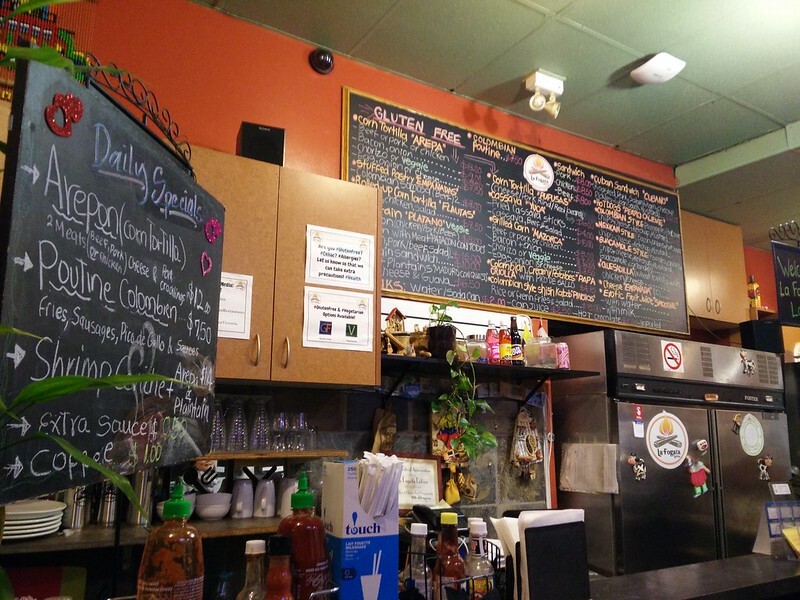 If you’re vegan or vegetarian, Mo:Le is a great choice for brunch. All of their dishes, if they’re not already vegan or vegetarian, can be modified to your dietary preferences. 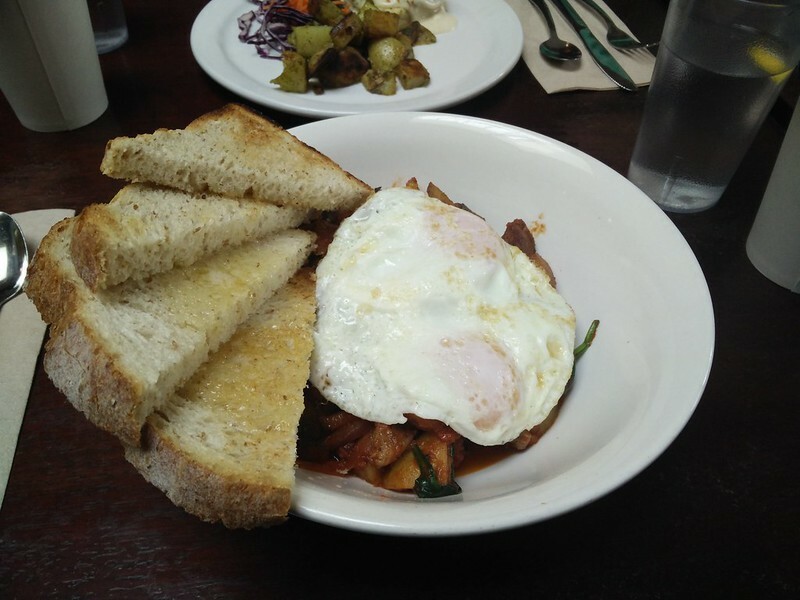 I opted for the tomato chipotle hash with lamb and pork sausage and over easy eggs. All the options on the menu looked so good though. When I lived in Victoria, there wasn’t much selection for good and affordable sushi. At least nothing as compared to what is offered in Vancouver. One of my favourite cuisines, we headed to Cook Village to try out The Next Modern Japanese Cuisine. While I found some of the items to be on the expensive side (who wants to pay $6.50 for a yam tempura roll?! ), a lot of their a la carte items like ramen and donburis were very reasonably priced and comparable to prices in Vancouver. I opted for a bento box with assorted sashimi and a crab roll. It also came with a spinach gomae appetizer and miso soup. 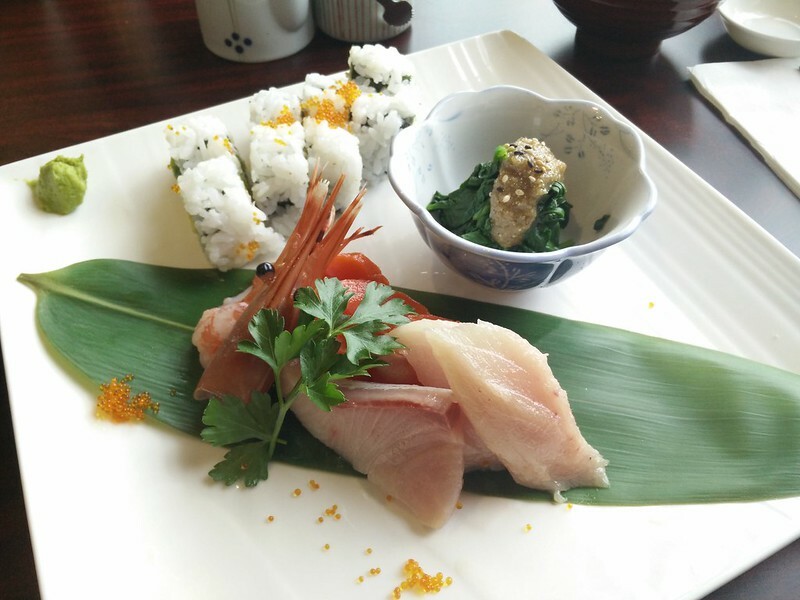 Definitely good value and the sashimi was super fresh and of good quality. And if you’re feeling sleepy after your sushi meal, head up the street to Moka House for a coffee. This was one of my favourite hang out places when I was going to school here. Rebar has almost hit cult classic status in the vegetarian, vegan, and healthy eating arena when dining out in Victoria. This restaurant has been here for as long as I can remember, but I had never visited until now. Generally afraid of things with too many beans and lentils, I opted for their mushroom and swiss almond burger. It was so tasty and filling, I can understand why this establishment has stood the test of time. You can even pick up a cookbook to recreate dishes from the restaurant at home. I know this post is supposed to be about Victoria in three meals, but I couldn’t resist including some snacking and dessert options as well. Whenever I have a chance to try latin restaurants, I usually leap at the opportunity since they’re so rare and far between in Vancouver. 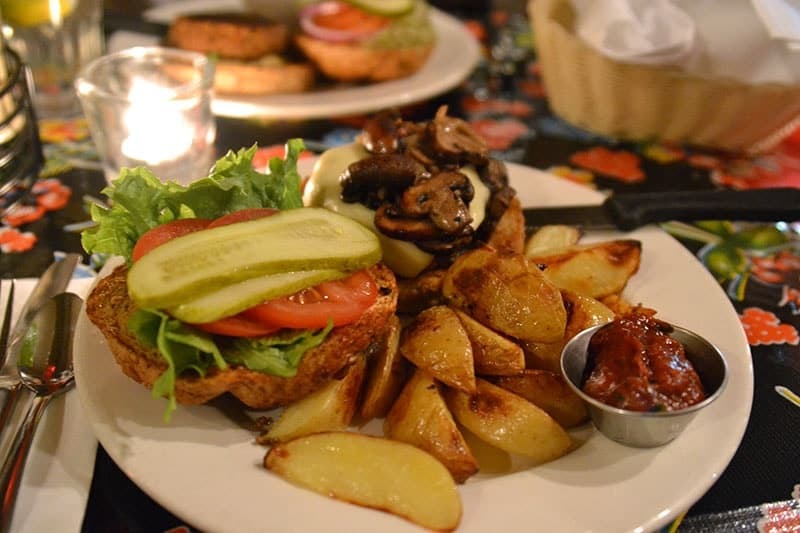 La Fogata is a Colombian restaurant which offers items like arepas, empanadas, and a variety of exotic fruit juices. Many items are also gluten free. Our visit was late at night and it took awhile for use to get our food, but at least we knew they were freshly made! 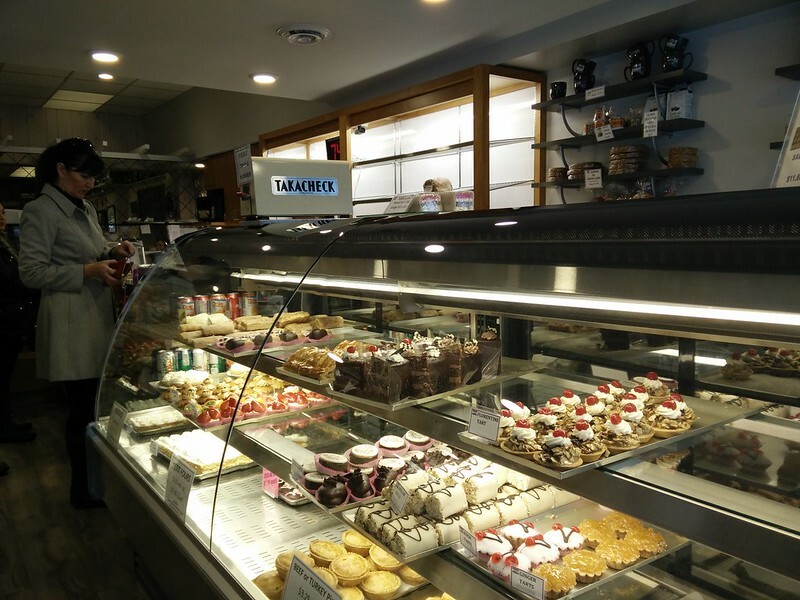 This was always a favourite place for me to grab a sweet treat when I lived in Victoria. I loved the variety of shortbread cookies they have on offer and occasionally splurged on a slice of cake with a Dutch twist. They also have a restaurant in the back where you can get breakfast all day, soups, salads and sandwiches. After a couple hours of shopping and wandering around downtown Victoria, we were searching for a place to grab a mid-afternoon snack. A friend had recommended a place for delicious pastries but we forgotten the name (found out later it’s Fol Epi and I need to make a return visit stat), so we ended up wandering into La Roux where I had the most buttery and flakiest croissant. They had lots of other pastries, cakes and macarons available too, but I was after something savoury. Who can say no to an ice cream sandwich? Not me! Which is why I found myself in the backseat of my friend’s car, heading to the ferry terminal desperately trying to finish my vanilla bean and chocolate chip cookie ice cream sandwich even though I was absolutely stuffed with my brunch. 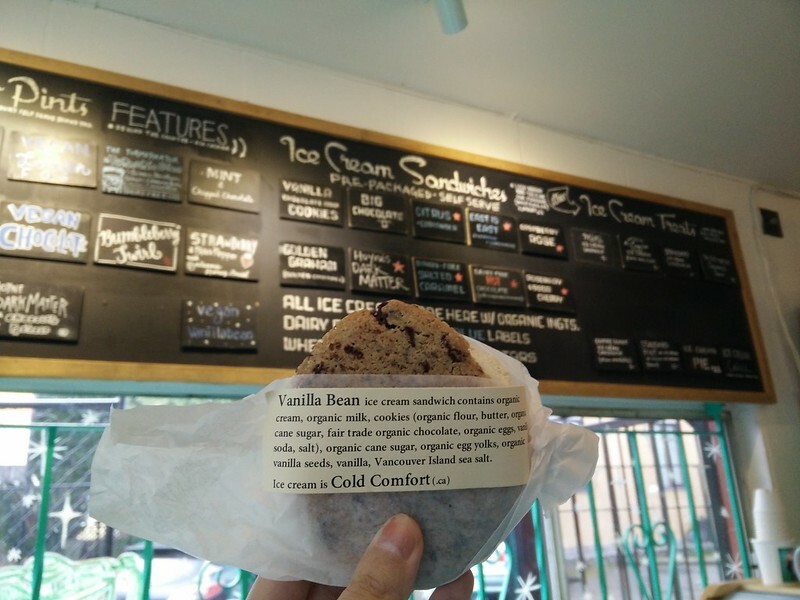 The artisanal ice cream trend has hit Victoria and Cold Comfort offers ice cream by the scoop, in the form of sandwiches and by the pint. 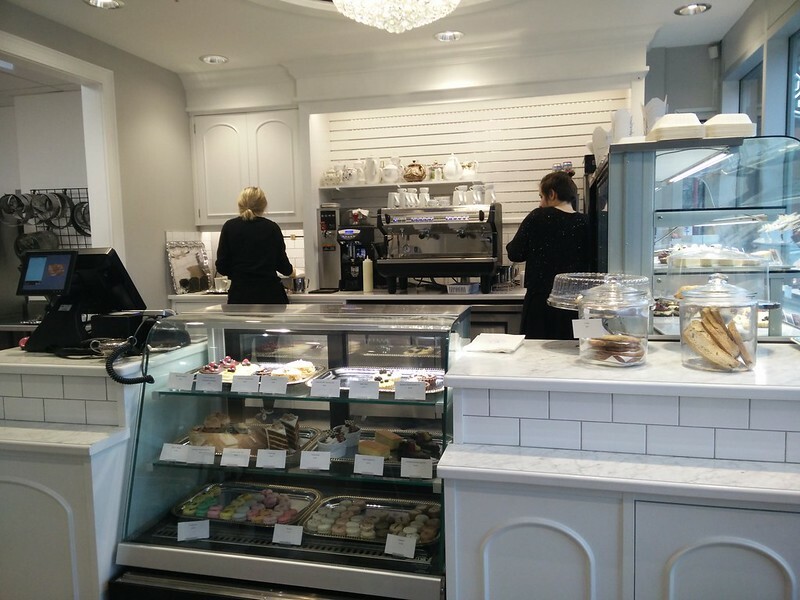 Flavours change by the day, but they also offer vegan and dairy-free options as well. This is an ice cream chain hailing from Quebec with a couple locations in Ontario and now Victoria. 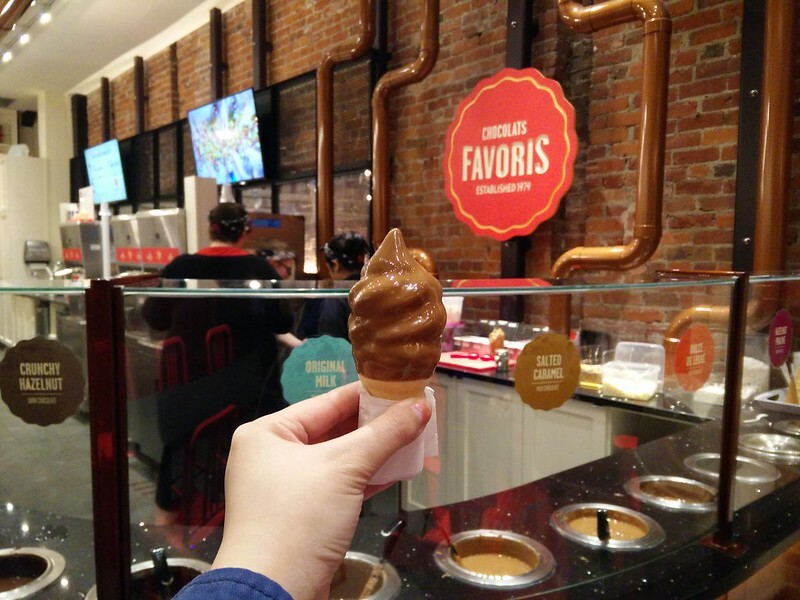 The premise is simple: soft served ice cream dipped in your pick of chocolate. Options range from salted caramel (what I picked) to dark chocolate and hazelnuts (what my friends picked) to cookies and cream. I loved the idea and it looked so good, but I found the chocolate dip so overwhelmingly sweet that I had to take the then hardened chocolate shell off my ice cream by the end of it. They also sell a variety of other chocolates and chocolate covered things that I wouldn’t mind trying. So there you have it everything and more that I enjoyed over this past weekend spent in Victoria. There are a ton of other great restaurants to check out, but that will have to be saved for another day. If you only have three meals in your hometown, what would you recommend? « Lost My Job, Now What? Travel Of Course! This is such a handy list! I’m traveling to Victoria next week so I’m definitely keeping this in mind. Thanks so much for the tips! Definitely the best thing to do sans job! That food looks awesome. I’m looking forward to seeing your in-between-job travels! Victoria seems to have lots of delicious options. I’m a big fan of Colombian food, so LA Fogata sounds delish! Victoria certainly has lots of tasty spots to explore. I have to confess that I’m a HUGE ice cream sandwich fan. You’ve got me craving the one at Cold Comfort.